Ground Zero in Scotland's Salmon Wars! Lamlash Bay off the Isle of Arran is ground zero in Scotland's 'Salmon Wars'. Yesterday (2 November), GAAIA and Elena Edwards of Wild Salmon First visited the scene of some of the worst crimes against the marine environment with local diver Howard Wood. 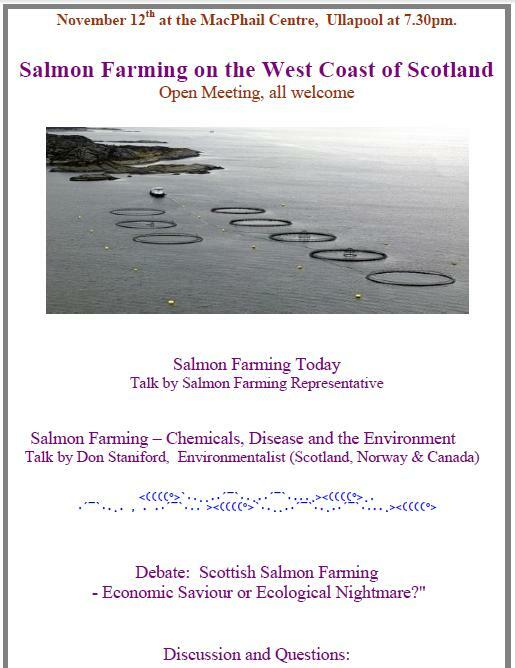 "The stench of Scottish salmon farming is nauseating," said Elena Edwards who is visiting from British Columbia. "Lamlash Bay is our first stop in a three week tour of Scotland and could be the worst!" "We're here at ground zero in Scotland's disease disaster," said GAAIA's Don Staniford. "They've had mass mortalities here dating back to 2007." "The area under the salmon farm is grossly impacted," said Howard Wood who has been diving in Lamlash Bay for decades. "This site has a long history of diseased farmed salmon." For video footage under Scottish salmon farms watch "Shame Below the Waves"
The Scottish salmon farming industry's weapons of mass destruction - infectious diseases, mass mortalities and toxic chemicals - are hidden behind the Holy Isle and St. Molios close to Scotland's first 'No Take Zone'. Sadly, when it comes to salmon farming it is a question of take, take, take. The Scottish salmon farming industry has spread like the Black Death plague as it encroaches further upon shellfish grounds, pristine bays and precious marine ecosystems. Lamlash Bay is home to rare corals and protected maerl beds. "Maerl is an ecologically important, calcified, pink coral-like seaweed that grows slowly on the seabed," explained Dr. Sally Campbell, our lovely host during our 2-day stay on Arran, to BBC News in 2010. "It forms interlocking pieces that provide nooks and crannies, ideal habitat where eggs and juvenile species can develop away from predators. Maerl is an important nursery area for many species including commercially important ones such as queen scallops, cod, saithe and pollack. Once maerl has been destroyed it is lost forever, so it is vital that any healthy area of maerl must be protected, urgently." Yet salmon farms like this one in Lamlash Bay have been allowed to impact upon maerl beds. "Scientific studies have clearly shown that the wastes from salmon farms impacts maerl beds," explained Howard Wood as we circled the salmon farm. "Lamlash Bay is a poorly flushed area and completely unsuitable for salmon farming." Read the scientific studies via "Impact of fish farms on maerl beds in strongly tidal areas"
For more details on the marine life of Lamlash Bay visit COAST's web-site. During our visit we also met Russell and Elspeth Cheshire who have been fighting to protect Lamlash Bay. Locals led by the Community of Arran Seabed Trust (COAST) successfully fought off plans from Marine Harvest for a new site nearby at Clauchlands back in 2008. Locals here on the Isle of Arran are certainly sickened by the disease-ridden salmon farming industry! Norwegian giant Marine Harvest farmed here for two decades until selling out first to the Norwegian company Pan Fish and then further Norwegian money in the shape of Lighthouse Caledonia who re-branded themselves in 2010 as the Scottish Salmon Company (a company listed on the Oslo Stock Exchange with shareholders including a who's who of Norwegian banks and Norwegian investors). The spread of infectious diseases has ravaged Lamlash Bay for years - with 279,000 mortalities reported in October 2011 following Scotland's first reported outbreak of Amoebic Gill Disease (AGD). The Arran Banner reported (5 November 2011) that an outbreak of Amoebic Gill Disease led to "dozens of industrial skips full of dead fish". This is not the first time that salmon farming on the Isle of Arran has caused a nasty stink. In 2008, The Arran Voice newspaper reported that: "Eight large containers of maggot-ridden dead salmon stood waiting for disposal on the slipway at St Molio’s fish farm in Lamlash Bay." "The photographs printed here were taken less than a week ago, as their digital date confirms, and they offer direct evidence that mortalities among the penned fish are still occurring," wrote Alison Prince. "A disease epidemic ravaged stocks last year, and statistics obtained from SEPA under the Freedom of Information Act confirm that from October to December 2007, a shocking total of over 300,000 fish died." "Lorry-loads of dead fish were seen leaving Arran during October and November 2007, but due to ongoing investigations, full details of the disease have been unavailable until now. Voice research found that the reported symptoms matched those suffered by fish infected with Proliferative Gill Disease, but the fish-farm owners would not confirm this. Over 40% of the salmon in the St Molio’s fish farm were killed due to the outbreak. Pan Fish site staff (then operators of the farm, which has since been rebranded as Lighthouse Caledonia) were removing 8,000 to 10,000 fish per day from the badly affected cages. A report from the Fisheries Research Service (FRS) also noted that ‘many moribund fish were observed on site in every cage, swimming uptide with snout against the uptide net.’ The disease is non-notifiable, but the FRS inspected the site after receiving reports about the high mortalities. Further laboratory examination of the affected fish identified ‘Chlamydia, gill pathology, parasites, amoeboid protists, a bacterial infection and focal haemorrhaging in the liver and pyloric caeca.’"
Read more via "Diseased farmed salmon cause stink in Scotland"